Doctor Who's - BEHIND THE EOCENES | Warped Factor - Words in the Key of Geek. Settle in for a prehistory lecture like no other as we examine the Silurians, the species said to have walked the Earth before we, and indeed the rest of humanity, did. But is Silurian even the correct name for them? The Third Doctor is hardly convinced, ruminating on the issue during The Sea Devils as he pondered a possible kinship between the two species. JO: Those things that attacked us. You said you'd seen something like it before. DOCTOR: Something very similar, certainly. They emerged from some caves in Derbyshire. 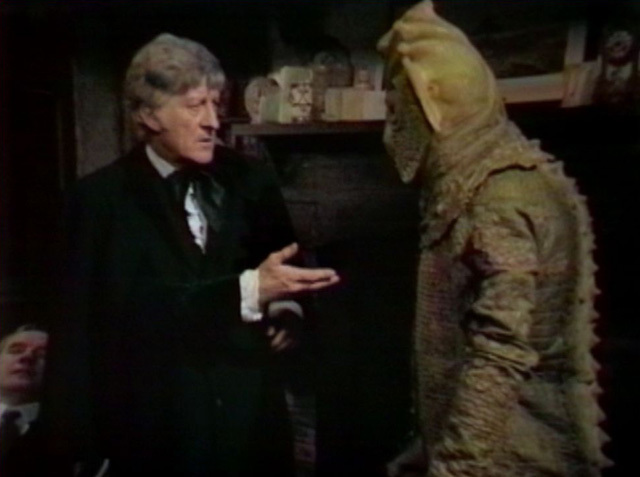 JO: The Silurians, wasn't it? The Brigadier was telling me. DOCTOR: That's a complete misnomer. The chap who discovered them must have got the period wrong. No, properly speaking, they should have been called the Eocenes. JO: That was that race of super- reptiles that had been in hibernation for billions of years, wasn't it? Indeed it was, though Miss Grant wasn't around to witness it. DOCTOR: Look, people are coming. Many people are coming here. I want you to meet them in peace. SILURIAN: Who are these people? DOCTOR: Well, they're soldiers, but they won't attack you unless you attack them first. Or at least for these purposes, it could have been! "Of course. This is the world as it was before the great continental drift, two hundred million years ago. And these notes, well, they're calculations on the age of the earth, with particular reference to the Silurian era." "...the impossibility of the title monsters actually hailing from the Silurian period of Earth's prehistory (about 400 million years ago). Instead, they now had the Doctor referring to the creatures as “Eocenes”, but unfortunately the Eocene epoch (about 16 to 54 million years ago) was barely more suitable, as it still came well in advance of the development of mankind's very early ancestors." Nonetheless their alternative naming appears in their return in The Hungry Earth/Cold Blood, as a drilling operation wakes them up in the first of many similarities with their origin story. "They're not aliens. They're Earth-liens. Once known as the Silurian race, or, some would argue, Eocenes, or Homo Reptilia. Not monsters, not evil. Well, only as evil as you are. The previous owners of the planet, that's all. Look, from their point of view, you're the invaders. Your drill was threatening their settlement." ALAYA: So we destroy them. DOCTOR: One tribe of homo reptilia against six billion humans? You've got your work cut out. And so we've come full circle- homo reptilia reflecting their supposed status as Earth-dwelling lizards well before even the most primitive humans began to stake claim to it. Handily there's a ready made answer for the question of "why did they go into hibernation in the first place?" as posed in Cold Blood. "Their astronomers predicted the planet heading to Earth on a crash course. They built a life underground and put themselves to sleep for millennia in order to avert what they thought was the apocalypse, when in reality it was the Moon coming into alignment with the Earth." For the Doctor, now in his Eleventh incarnation, all this is of course old hat having first encountered the Silurians/Eocenes/homo reptilia while he was still getting used to being the man he had been eight selves previously. But if you hadn't yet seen Doctor Who & The Silurians, a handy summary was available as the Eleventh managed to explain what had gone down back then. DOCTOR: Long time ago, I met another tribe of Homo Reptilia. Similar, but not identical. RESTAC: Others of our species have survived? DOCTOR: The humans attacked them. They died. I'm sorry. And the genocide was carried out under the orders of Brigadier Lethbridge-Stewart against the express wishes of his unpaid scientific adviser! DOCTOR: Yes, well, everything seems to be working quite smoothly. I don't think they'll be any more trouble. DOCTOR: Now, don't forget, Brigadier, nobody is to go into that Silurian base. DOCTOR: Miss Shaw and I will be back as soon as possible with some testing equipment and probably some other scientists. BRIGADIER: Good, good. Well, have a good journey. DOCTOR: Yes. Don't forget, Brigadier. Nobody is to go into that base, all right? I'll see you tomorrow. But then after the velvet- caped crusader & his first companion leave, he has his own orders to follow. BRIGADIER: Give them time to get clear, and then set off those explosive charges. I want that Silurian base sealed permanently. "So the Doctor sent our warriors back to their rest, on the promise of future harmony with humans." And surely as Series Nine approaches we must ask ourselves whether the time has come to see whether that harmony can, or indeed will, exist?